The archaeological area of Piazza Ferrari presents a clear view of different buildings, a formidable historical and urban stratification bearing witness to 2000 years of our history. Together with the Surgeon's House, other finds were unearthed i.e. traces of a building dating from the Late Republic period and finds of an Early Medieval settlement. The House is located in the northern sector of the excavation area of Piazza Ferrari. It represents the main structure: this archaeological site is particularly interesting owing to its preservation and to the wealth of equipment. 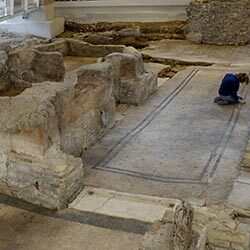 The Surgeon's House is an excellent example of roman 2nd century A.D. architecture with its rooms decorated with mosaic floorings and with polychrome frescoes. The owner of the House was a doctor named Eutyches. The most important find unearthed in the house is a remarkable collection of 150 surgical items. On the basis of the excavation data it has been possible to define the identity of the owner of the House: a military doctor, probably coming from Greece. The House was destroyed by a fire shortly after the middle of the 3rd century during raids by Germanic tribes. After 260 A.D. and the destruction of the Surgeon's House, the building of the new town walls, including partially also the site, took place. The area was later completely abandoned until the early 5th century, with the transfer of the Imperial capital to Ravenna by the Emperor Honorius. In the southern part of the excavated area a luxurious residence was unearthed and the owner was probably a rich dominus. The building had a large courtyard with canals and a nymphaeum and many rooms decorated with geometric patterned polychrome mosaic flooring flanked by an angular corridor. 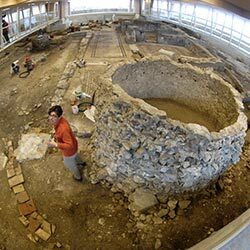 A room heated with hypocaust and a large rounded hall was certainly used as a reception room by the owner. The late antique Palace began to decline during the 6th century at the time of the war between Goths and Byzantine Greeks. After the decline of the late antique Palace, destroyed and buried, the area was covered by a small cemetery, probably connected to a religious building nearby. At that time, following the Christian custom, the burial within the town walls was allowed. A number of tombs can be seen on the site. 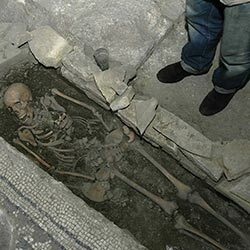 The bodies (some of which are visible) were buried in simple ditches, occasionally protected by tiles, often covering and ruining the mosaic flooring below. The burial area was used into the 7th century, and later the ground was occupied by new dwellings. The excavations have brought to light a building dating to the Early Medieval period. The House unearthed was surrounded by open spaces, gardens and was built with perishable materials: wood, clay and beaten earth. Some of these structures are still to be seen, such as the large hearth. After the 8th century the area was not built on and was covered with earth. Only between the 16th - 18th centuries will the site be used as storage area belonging to the churches of San Patrignano and the Religious House of "Convertite".